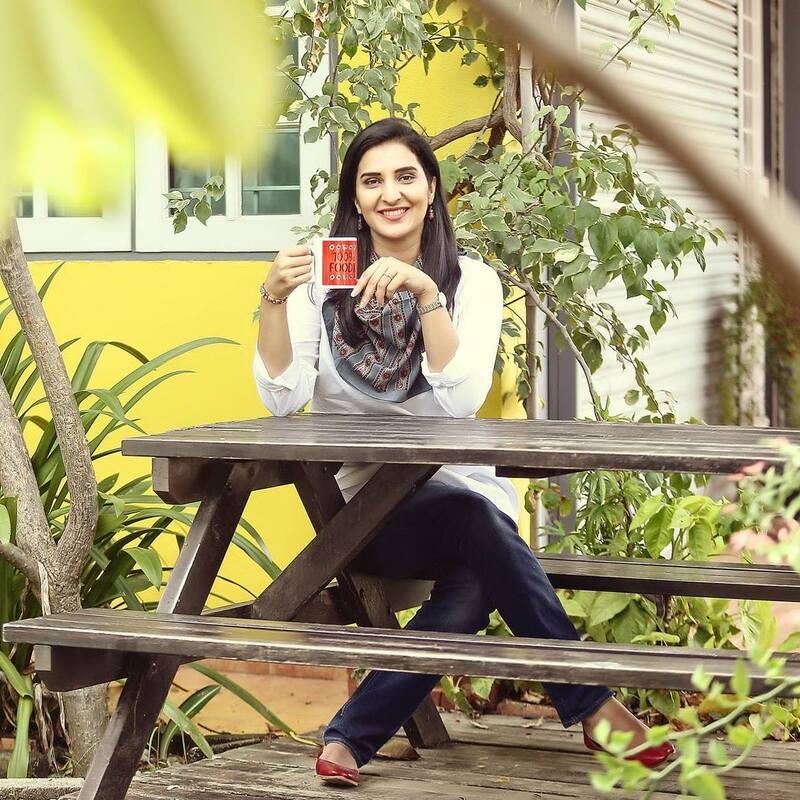 The Ordinary Girl : K For Karachi - A Must Have! K For Karachi - A Must Have! My hubby and I normally don’t surprise each other with gifts. As buying a gift for him is really difficult, I initiated no-gift policy that we both happily agreed on. But, recently he has been defying the rules and has surprised me with some really thoughtful gifts :) This birthday he got me something that I had seen last year and had set my heart on it. I had decided to buy it whenever I'd visit Pakistan. It was a difficult waiting time I tell you! But, but ... he managed to buy it for me, breaking our rule (Yeay!) and arranged it all with absolute secrecy, ensuring I receive it on my birthday! I have no clue how he managed to keep this secret from me as he can (always) never hide such things! It is a win-win situation for me so not asking a lot of questions! 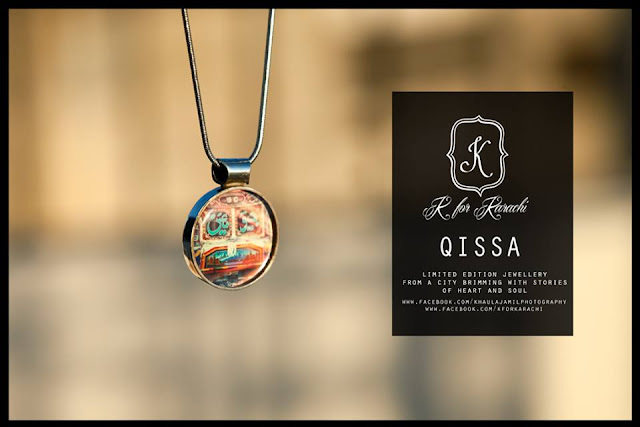 So here it is… these breathtakingly beautiful, limited edition ring and pendant from K for Karachi. It says ‘Pakistan’ in Urdu - the name of my country <3. It is a photograph of a graffiti in Karachi. The Photograph is taken by Khaula Jamil, a Pakistani photographer. 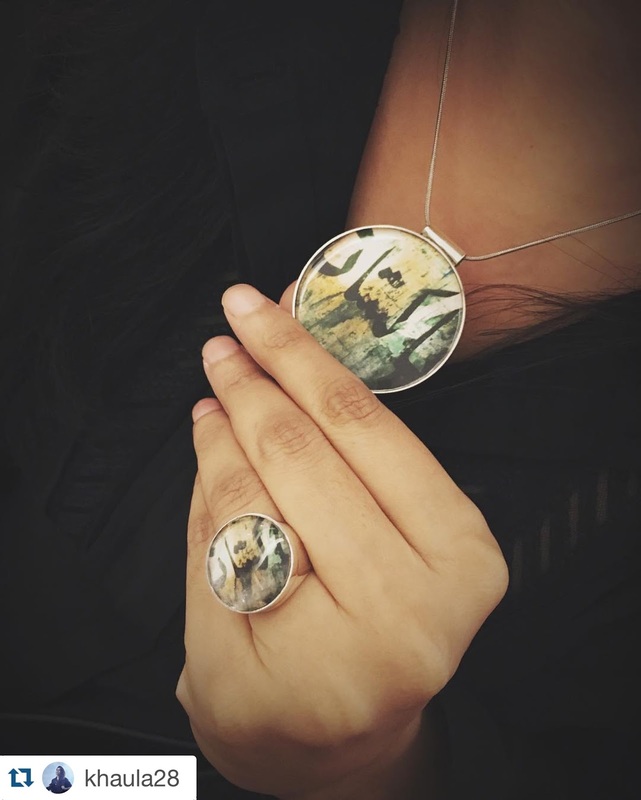 Khaula Jamil is the brain behind this whole creative venture, K for Karachi, where she not only takes beautiful images of buildings, buses, walls, graffiti etc but also seals them into theses jewelry pieces, immortalizing the beautiful city. For those who do not know, Karachi is Pakistan's largest metropolitan city. The diversity of this city makes it an interesting kaleidoscope of colours and cultures. You do not need to be a Karachite or a Pakistani to admire these. Anyone who loves jewelry that makes a statement, will fall in love with these artistic creations. 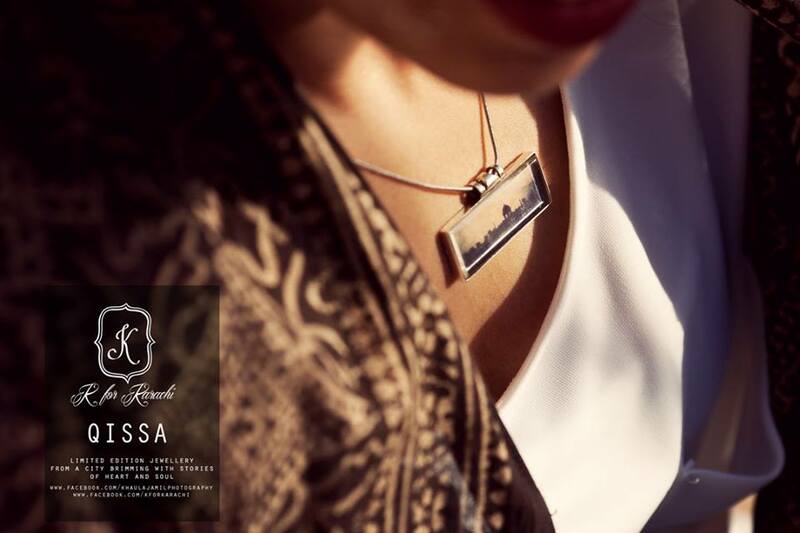 These pieces are art that you can wear all the time! Because I live away from home, a ring and pendant with my country's name was my first choice. But there are ample of designs to choose from. I have taken a few designs from their Facebook page for you to take a look at. All jewelry at K for Karachi is completely handmade and in pure silver. The quality is top notch. My husband directly contacted Khaula and she provided him the best service. You can drop them an email and get the information of prices and delivery process. I wore it the same day for my birthday dinner! I have not been able to part with the ring and have been often found staring at my own hand. I am wearing it constantly day in, day out and everyone that I have met has noticed it and inquired about it. It goes perfectly well with both Eastern and Western attire. ..... and because I cant have enough of it, here is one more photograph! It's always nice to have a husband who can be very thoughtful especially when it's a surprise. You have a very sweet husband to get this gift for you. The jewelry set is very beautiful and so incredibly thoughtful. I really like the square necklace too. Your husband is the bomb.com for the sweet surprise! Very beautiful pieces! I like how your husband is breaking the rule. It's very sweet of him. So cute! Love the ring! OMG! So adrobs. Getting them definitely! Wonderful piece, the design is so calm and cool. You rock/he rocks. Awesome! You are making me fall in love with it. And what is the nail colour? What beautiful pieces! I'm not a huge jewelry pieces, but these are beautiful! How beautiful of a gift and how thoughtful of your husband. Lucky girl! what a thoughtful gift! These pieces are very beautiful, and you are correct, one does not have to come from that area in order to enjoy them - they are stunning and unique - blessings! Thank you everyone ... I cant show them off enough .. haha! For my anonymous friend who asked me the nail colour, it is 'Slapper' of 'Butter London' - I got it from Sephora Kuala Lumpur. Loved the present! You lucky girl, Masha'Allah!